It rained this morning in Minneapolis. Luckily, that ended pretty quickly and the day was off to a quick start with the major symposia on epigenetics, with all of the speakers discussing the methylome (all of the DNA that ends up methylated in the genome, in what cells & in what conditions it occurs in specific places in the genome. Word cloud generated by Danforth Center scientists. Data from Twitter was collated by the Danforth Center data analyses to generate the above word cloud for the conference. It’s an example of why it’s a pleasure to be a part of this community. And I am grateful for today where a lot of really interesting things happened at #plantbiology15 (search the hashtag!). The day started with the session on epigenetics, namely the methylome– the total amount of DNA that is methylated in a genome. The question of “does it matter?” came up a fair bit, but in fact, DNA methylation does matter; at least in some cases. I have to say that Bob Shcmitz (@Schmitz_Lab) did a great job of presentation. He had his opening slide with a Twitter logo and the words “twitter friendly talk”. It’s so refreshing to see that and to tweet with confidence, rather than parsing whether a result is published already or not. But it was good so see someone doing that. After the morning symposia and some workshops over lunch, it was time for round two of mini-symposia. I spent my lunch time visiting vendors for the last time and a tweet up for non-twitterers. i’m proud that we got a few people to adopt Twitter at the conference. 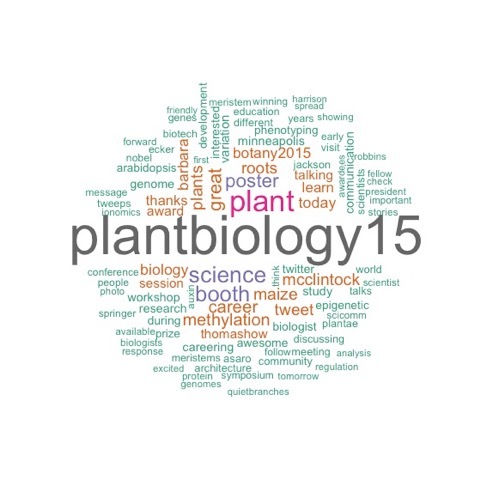 Again, I’ll encourage searching the hashtag #plantbiology15 to catch up with all the day’s happenings, including the word cloud above. I think the mini-symposia were fantastic ,though I only attended the hormone biology and gene regulation sessions. Fascinating work being done in both fields, and in fact they probably overlap. Then, it was the poster session which was better than usual I thought. Several people stopped by my poster and I hope everyone else had a favorable experience with putting there’s together. And then I had a meeting that turned into a night out and both were fun. I’m writing this at 2:30am, and so this post lacks detail and is short and vague. Sometimes serendipitous things happen like plant scientist’s coloring in artwork of plants in improper colors even. A fun art project for the community, again, ideally to help them learn and solidify ideas in their heads. Two events happened tonight, a workshop on the industry career option as well as the Minority Affairs dinner, which was also fantastic based on tweets I’ve seen. (again search #plantbiology15 for more). Conferences are funny things, so much chaos wrapped into a few days, but today, instead of being up really late, I feel pretty energized by my day. So many great people, connections, ideas. That said, there’s more great science to come & well as a closing party to look forward to. I need some sleep now to make it through. Good night Plant Biology. See you again tomorrow. Previous Previous post: The worst. And the slightly hopeful. Next Next post: Ian 3.0, stalled? or just slow?